Japanese Knotweed, or Polygonum Cuspidatum, is a Traditional Chinese Medicine used for circulation and heart health. It is a very good source of resveratrol, and most benefits of Japanese Knotweed may actually just be benefits of Resveratrol. Our evidence-based analysis on japanese knotweed features 55 unique references to scientific papers. Polygonum Cuspidatum var. Japonicus is the species of plant most commonly referred to as Japanese Knotweed. This plant is an invasive species yet has been used traditionally in Chinese and Japanese medicine for its benefits on gastrointestinal health and circulatory health (among some other claims such as cancer prevention). Composition analysis of Japanese Knotweed reveals it to be a vessel for Resveratrol (as well as a few other compounds structurally similar to resveratrol and may act in the same way) and anthraquinone compounds that possess slight laxative effects; like Senna root but less potent. Most of the effects of Japanese Knotweed can be traced back to either the stilbenes (resveratrol) or the anthraquinones (emodin) for the circulatory and gastrointestinal help, respectively. Most research on Japanese Knotweed has been pertaining to either suppressing its invasive tendencies, or controlling it to become a large scale producer of Resveratrol for medical or supplemental usage. Limited trials have been conducted in humans, but it appears to have similar effects to resveratrol due to the resveratrol content. You are now following Japanese Knotweed. You will be notified when any significant update is made. The only current human study used Japanese Knotweed at 200mg daily and standardized to 40mg Resveratrol which was effective. Although there are other bioactives in Japanese Knotweed, it may be prudent to dose it in accordance to the dosing guidelines on the resveratrol page. The Human Effect Matrix looks at human studies (it excludes animal and in vitro studies) to tell you what effects japanese knotweed has on your body, and how strong these effects are. Polygonum Cuspidatum is a herb in the polygonaceae family (alongside Rheum palmatum L and the similar plant Polygonum multiflorum) and the genera of Fallopia; it is native to eastern China and Japan and is sometimes (most commonly) referred to as Japanese Knotweed. Polygonum Cuspidatum has been used traditionally for its medicinal qualities, specifically treatment of artherosclerosis as well as cancer, asthma, hypertension, and cough. Traditional usage in China is associated with the name Hu Zhang or Hu Chang, and traditional usage in Japan is associated with the name Kojo Kon. Japanese Knotweed (and other terms, such as Mexican or Japanese Bamboo) are more commonly used in North America. Interestingly, Japanese Knotweed is seen as an invasive plant species and causing problems in a variety of areas in the globe. The following molecules are found in the three variants of Polygonum Cuspidatum, but the quantities specified below are specific to var. Japonicus; this variant tends to be highest in stilbenes, with minimal levels in the other two species. Anthraquinones such as Rhein and Physcion; but mostly Emodin as well as their glucosides At 35.3mg (Emodin) and 8.2mg (Physcion) from 6.7g dry extract, and 17.6mg (anthraglycoside B) from 4.6g dry extract; 5.2mg/g, 1.2mg/g, and 3.8mg/g respectively. Overall, a phenolic content of 641.1 +/- 42.6 mg/g (60-68%) and a flavonoid content of 62.3 +/- 6.0 mg/g (5.4-6.8%) has been reported for the dry weight of general Japanese Knotweed extract. Resveratrol and its glucoside piceid range from 0.04-0.1mg/g and 0.2-0.51mg/g in Polygonum Cuspidatum var. sachalinensis, while piceatannol and its glucoside Astringin range from 0.006-0.008mg/g and 0.04-0.22mg/g, respectively. Polygonum Cuspidatum var. bohemica ranges from 0.08-0.95mg/g, 1.72-7.32mg/g, 0.01-0.095mg/g, and 0.31-1.87mg/g for resveratrol, piceid, piceatannol, and astringin respectively. Put collectively, Japonicus is the standard and appears to be best while bohemica can potentially be competitive and sachalinensis possesses much less stilbenes than the other two variants. Resveratroloside appears to be similar in content to piceatannol when measured. The following structures are the four (most commonly researched) stilbenes found in Japanese Knotweed; the stilbene resveratroloside looks the same as piceid except with the glucose moiety bound to the 4' carbon rather than the 3 carbon (other hexagon of the structure, on the opposite side of the middle chain). Polydatin is also similar, in the fact that its glucose moiety is bound to the 5' carbon (one below the 4'). Resveratrol and its glucoside Piceid appear to be structurally stable when exposed to light and the open environment (room temperature) for up to three months, although stability of resveratrol in Japanese knotweed insulted by environmental stressors is not as good; prudency and good storage should still be practised. In general, Japanese Knotweed extract possesses moderately potent anti-oxidant capabilities, second to the species of capitatum but higher than chinensis and multiflorum as assessed in vitro. The anti-oxidant capacity of Polygonum Cuspidatum has been reported to be 56.22mmol/100g Trolox equivalents and 6.33g/100g Gallic acid equivalents, and has been shown to extend to the leaves and stems as well as the roots. According to this study which analyzed 112 herbs and summed up that anti-cancer herbs from Traditional Chinese Medicine tend to have higher anti-oxidative capacities than common fruits and vegetables, it was found that (according to Trolox equivalents of the methanolic extract, a way to measure anti-oxidant potential) Japanese knotweed placed 14th out of 112, with 35% of the potency (on a gram to gram basis) as Camellia Sinensis, the most common source of Green Tea catechins and 5th place overall. The winners were the gall of Rhus chinensis and the branch/stem of Acacia catechu, with 3.28x and 2.12x greater anti-oxidative effects relative to Camellia Sinensis, respectively. Resveratrol has had its pharmacokinetics analyzed on its own page; a short summary is that oral ingestion of resveratrol has poor bioavailability but it can be enhanced with consumption of other nutrients alongside it. Distribution of resveratrol after oral administration (20mg/kg) in rats appear to reach the heart (up to 743.4+/-45.77ng/mL) yet are excreted almost completely by 60 minutes, the liver at around 2mcg/mL (2,000ng/mL) for up to 60 minutes, up to 2.8mcg/mL in the lung tissue at 60 minutes yet almost undetectable prior, moderate amounts in the kidney (0.8-1.3mcg/mL) between 30-60 minutes, with most being detected in the stomach and none in the brain at up to 60 minutes. This is similar distribution data found in mice given isolated resveratrol, except none was found in the brain in this study; the lack of finding resveratrol in the brain, as well as the high (48.2mcg/mL) content in the stomach may be due to the study terminating at 60 minutes. Similar to Resveratrol in isolation, the resveratrol from Polygonum Cuspidatum appears to be highly conjugated with minimal free resveratrol being excreted in the urine. 0.059% of the oral dose was found in the urine unconjugated, and 0.027% was found in the bile unconjugated; leaving 99.14% of the oral dose of resveratrol either excreted as a conjugate or distributed into a tissue 24 hours after oral administration. Polygonum Cuspidatum appears to be able to inhibit both the CYP3A enzyme as well as the efflux protein 'MultiDrug Resistance Protein 2' (MRP2) and may interact with pharmaceuticals such as carbamazepine that are metabolized by these enzymes. In an investigation into whether Resveratrol from Japanese Knotweed could upregulate CYP3A4 via CAR, it was found to not possess this capability. The one human study conducted using Japanese Knotweed found that, after 6 weeks supplementation of 200mg (40mg Resveratrol) daily, that extracted immune cells had 25% less translocation of NF-kB; NF-kB is a mediator of inflammation, and this was overall a reduction in inflammation. The reduction in NF-kB activity resulted in less circulating TNF-a and IL-6 as well; two inflammatory cytokines. Large doses in animals (100-200mg/kg ethyl acetate fraction) have been shown to induce anti-inflammatory effects acutely, and showed promise in an animal model of rheumatoid arthritis. The napthaquinone from Japanese Knotweed has been demonstrated to be a potent inhibitor of the HRV 3C-protease enzyme with an IC50 of 4.6uM. This enzyme is required for replication of the Rhinovirus, which is the most common agent for the common cold; thus inhibitors are being investigated for reducing the occurrence of and severity of the common cold, such as rupintrivir (AG-7088). Emodin, the anthraquinone compound, is being investigated for its ability to suppress activation of mast cells via preventing IgE from associating with FcɛRI. The binding of IgE to FcɛRI on mast cells is the first stage of the anaphylactic response on mast cells, and eventually results in histamine release. Emodin seems to inhibit this response dose-dependently after oral administration of 5-40mg/kg bodyweight and Japanese Knotweed extract appears to be quite effective as well, with an IC50 value of 62+/-2.1ug/mL on mast cells. Polydatin, or the glucoside of resveratrol, has been shown to protect rats from cognitive decline in a model of dementia when supplemented over 30 days at 12.5, 25, and 50mg/kg bodyweight orally. 25mg/kg Polydatin was slightly less protective than 25mg/kg Ginkgo Biloba, but insignificantly so. Resveratrol from Japanese Knotweed also shows benefit itself at 20mg/kg oral ingestion. Napthaquinones from Japanese Knotweed do show protective effects as well in vitro, secondary to their anti-oxidant effects. Oxidative damage was completely abolished, and cell viability actually increased above control at the higher concentrations tested (2.5uM, 5uM; 0.05-1uM protected but did not increase viability above control). Emodin has been demonstrated to protect neurons from damage in vitro, but these results may not be practically relevant as emodin possesses a low bioavailability. In a study on 32 traditional Chinese plants, it was found that Japanese Knotweed was the most potent with an EC50 value of 6.4ug/mL. Other herbs that were found to be slightly estrogenic were Horny Goat Weed (EC50 of 100ug/mL), Astragalus membranaceus (EC50 of 236.1ug/mL), Belamcanda chinensis (EC50 of 142.8ug/mL) and second place went to Rheum palmatum (EC50 of 46.7ug/mL) ; all 70% ethanolic extracts and assessed in bacteria expressing the estrogen receptor. 17β-estradiol itself had an EC50 of 0.205ng/mL, for comparison. The active molecules behind this estrogenicity may be the anthraquinone content, although they appear to inhibit binding of 17β-estradiol to its receptor when coincubated and may act as both agonists (during estrogen deficiency) and competitive antagonists (during estrogen surplus). However, emodin (the most prominent anthraquinone) has an EC50 of 10.1+/-0.36 ng/mL while the whole knotweed was more effective at 6.4ug/mL. suggesting there is another compound with potency estrogenic effects. One study dividing fragments of Polygonum saw that the fragment with the most emodin (Hzs1) was matched by one with no emodin content (Hzs6), and this was contributed to an unknown compound. After 6 weeks of supplementation of 200mg Japanese Knotweed (containing 40mg resveratrol) daily, no significant effects were observed on body mass or circulating leptin levels. Japanese knotweed has been shown to somewhat permeate the skin, and thus its usage as a cosmetic agent for topical application has been investigated. When tested in melanocytes (melanin producting cells under the skin), a component in Polygonum called Piceid is able to inhibit tyrosinase activity in a dose-dependent manner and may act as a skin lightening agent. Piceid is not a potent inhibitor of tyrosinase directly but appears to suppress mRNA and subsequent protein content of tyrosinase. Resveratrol also possesses an indirect inhibitory mechanism, as Resveratrol is a substrate for tyrosinase and its metabolites then accumulate and inhibit activity. Piceatannol, also a component of Japanese Knotweed, can suppress melanogenesis via tyrosinase by its anti-oxidant effects, and like Piceid it can downregulate melanin content and Emodin, the anthraquinone, can suppress tyrosinase activity directly although the related anthraquinone physcion is more potent and had 48 times more dermal penetration. Beyond lightening, Japanese Knotweed has been shown in rats to accelerate wound healing and enhance the quality of the repaired wound relative to an untreated control. Anti-inflammatory effects of Polygonum Cuspidatum have also been seen when applied topically, mostly due to the trans-resveratrol content. Eradication of the biofilms produced by the bacteria Propionibacterium acnes, which plays a role in acne, can also be done by Resveratrol; by extension, Japanese Knotweed may alleviate acne when topically applied. Interestingly, this study extends to both Rhodiola Rosea via Salidroside and Horny Goat Weed via Icariin. 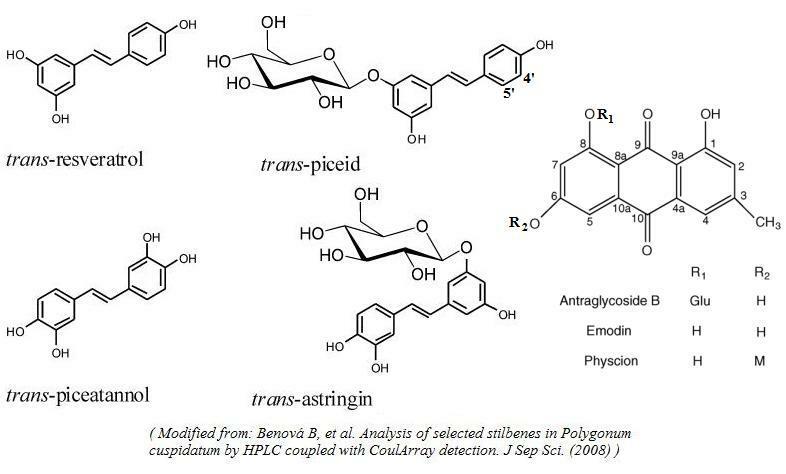 ^ Analysis of Rhizoma Polygoni Cuspidati by HPLC and HPLC-ESI/MS. ^ Cleavage of small peptides in vitro by human rhinovirus 14 3C protease expressed in Escherichia coli.